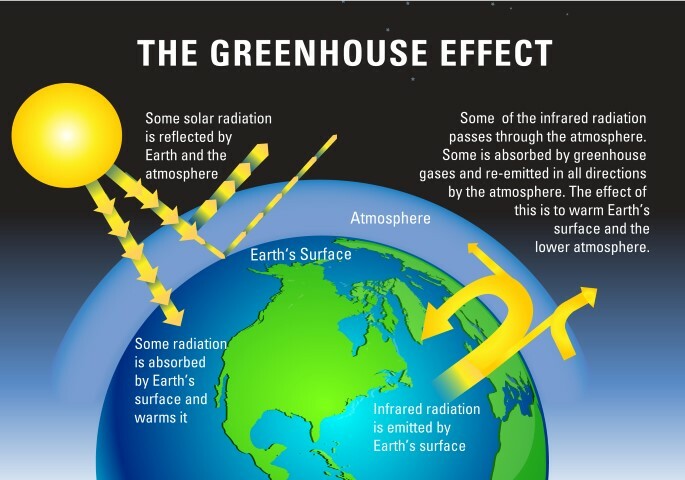 Home Climate What is the Greenhouse Effect? The expressions “Greenhouse Effect” and “Greenhouse Gases” are now used so frequently that few people stop to think about what they really mean other than to vaguely associate then with the phenomenon of climate change. The mechanics of the atmospheric trapping of heat have been understood since the 19th century, or possibly even earlier but there is some confusion about who first came up with the greenhouse analogy. The first thing to say is that the heating of a greenhouse and the heating of the planet have little in common and completely different mechanisms are involved but the usual flawed explanation is that radiant heat from the sun enters the greenhouse through the glass panes, heats the ground and other internal items and in the process emits radiation of a longer wavelength to which the glass panes are largely opaque. In reality the temperature in a greenhouse rises on a sunny day simply because the heated ground heats the air and lack of a convection air flow allows the temperature to rise. The simple act of opening the door and windows will soon disperse the additional heat. Most people can readily relate to this analogy when considering the heating effect of the Earth’s atmosphere with the so-called greenhouse gasses taking the place of the glass panes. Do We Need The Greenhouse Effect? The simple answer is a very definite “Yes!” Without our atmosphere, the planet Earth would be a very cold place indeed and the distance from the sun means that any radiant energy would have a minimal heating effect as most of this energy would simply be reflected back into space. The Earth’s atmosphere has formed over a period of many millions of years and is crucial for the existence of all living things. Although we usually consider the chemical makeup of the atmosphere to be constant, during the history of the earth, it has changed significantly as has the nature of life on Earth. Shortwave energy from the sun reaches the atmosphere and is partly reflected back into space but most of it passes through to the Earth’s surface where it is partly absorbed causing heating and partly reflected as a long wavelength energy. Some of this reflected energy passes away into space but some encounters molecules of the so-called greenhouse gasses which are tuned to become energised when exposed to energy of a certain frequency. These energised particles then re-emit the energy in all directions some of which heats the atmosphere and surface of the Earth. What are The Greenhouse Gasses? Various substances contribute to the greenhouse effect including water vapour in the form of clouds but the most important are the carbon based molecules such as carbon dioxide, carbon monoxide and methane. Why are Things Worse Today Than in The Past? Most people consider the composition of the atmosphere to remain stable as the chemical make-up of the Earth is fairly unchanging and there are only a finite number of carbon atoms in existence but this is not the case and many of today’s problems are assumed to be due to a combination of deforestation and the use of fossil fuels. During the Carboniferous period, about 360 to 300 million years ago, there was prolific tree growth mainly in swampy conditions. At the ends of their lives the trees would become submerged and then compressed eventually forming today’s fossil fuels. As a result of this, a vast amount of carbon was effectively locked away only to be released when later used as fuel. Interestingly, the Carboniferous period began with very high temperatures but ended with a severe ice-age lasting for millions of years. Various theories have been put forward to explain this but one possible explanation could be that carbon removal on this scale may have actually resulted in the depletion of greenhouse gasses leading to global cooling. Although none of us can predict the future, the signs are that in the next few thousand years the Earth will probably slip back into an ice-age as it has regularly done in the past few million years but the immediate future is of more concern and we have yet to see whether potential global warming can actually be controlled by human intervention. Another concern worth mentioning is the problem of the thinning ozone layer. Ozone is an unstable gas which is constantly being formed and destroyed at high altitude. This layer is mainly regarded as a barrier against harmful radiation but also has some input as a greenhouse gas so in some ways a hole in the ozone layer may even be seen as effectively leaving the greenhouse window open. The holes in the ozone layer were at their worst in 2008 and have been recovering (slowly) since then. But a relatively new chemical has been identified which is a serious threat to this recovery dichloromethane (CH2Cl2). It is released in industrial processes so we need fast legislation on this to prevent its use. Ice cores have been examined to produce a record of the atmosphere by examining the bubbles. Variations in dust levels and CO2 inclusion can be measured. You cannot measure the original atmospheric temperature as the bubbles are at the temperature of the ice from long exposure to it. You can infer the temperature by using the level of CO2. In other words you construct the temperature graph and it looks like the CO2 graph. It is published and Al gore uses the image as proof that temperature and CO2 are correlated. Of course, it is the correlation is man made in constructing the graph. This is not sound science but alarmist politics. Has anyone drawn a illustration of water production and all effects of water ie. powered cooling effect of water?